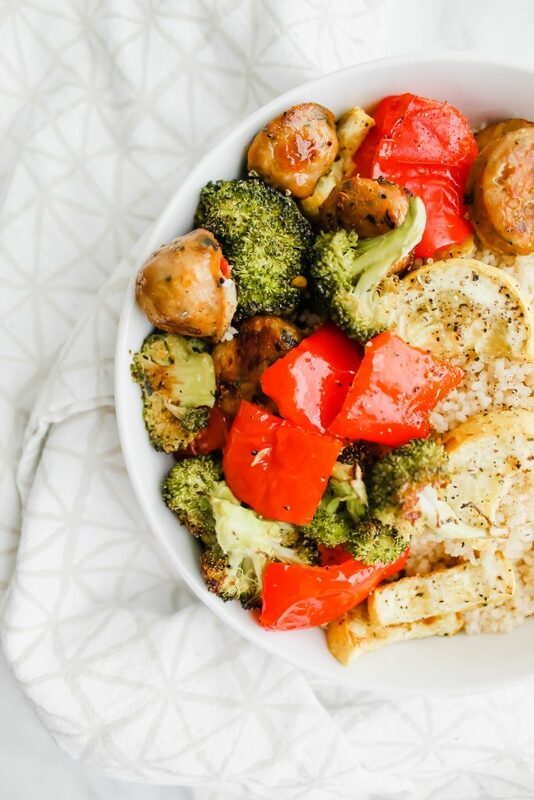 This Healthy Sheet Pan Sausage and Veggies recipe is out of this world! 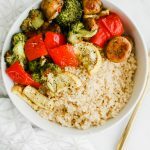 It’s simple, effortless and you end up with caramelized roasted veggies and spicy Italian sausage on ONE sheet pan! 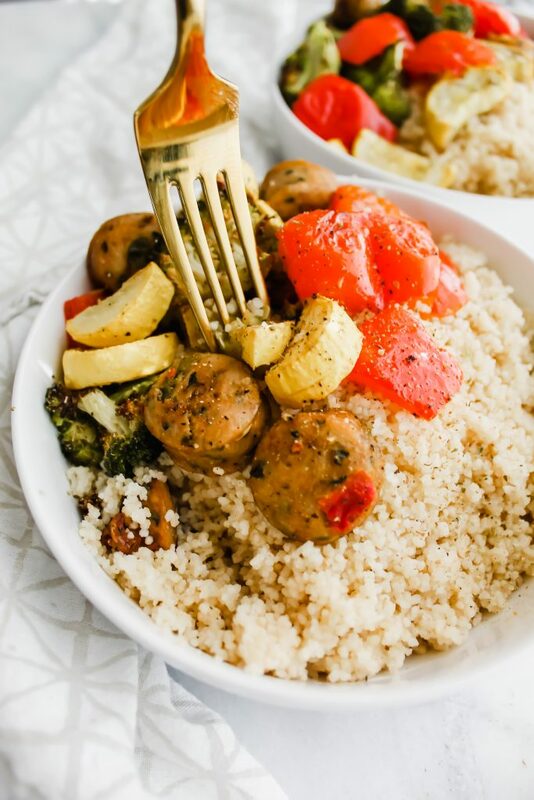 All on a bed of buttery couscous, this meal is a winner! Sometimes you don’t have to reinvent the wheel to create something extra magical. 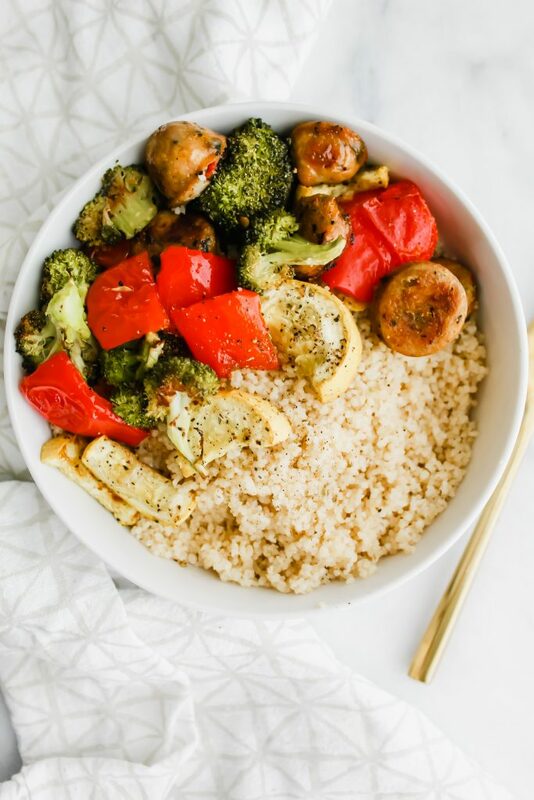 Those are my exact feelings about this Healthy Sheet Pan Sausage and Veggies recipe. It’s wonderful, low maintenance and extra extra delicious. It’s pretty simple, actually. It’s a meal that you throw everything onto a large sheet pan, drizzle with olive oil and spices and pop it in the oven. And your dinner is ready 30 minutes later! Yeah, needless to say, I’ve been seriously freaking out this week! I mean, they’re saying this could be the biggest storm on the East Coast in six decades! Thankfully, the predictions are showing that we will probably only get about 7-10 inches of rain, some potential flooding and of course, the heavy winds which could cause major damage. It’s nothing like the Carolina Coastal regions, which are predicted to have devastating effects. I’m praying for all of those who live in the Carolinas, those who will be affected and those who have family who may be affected. 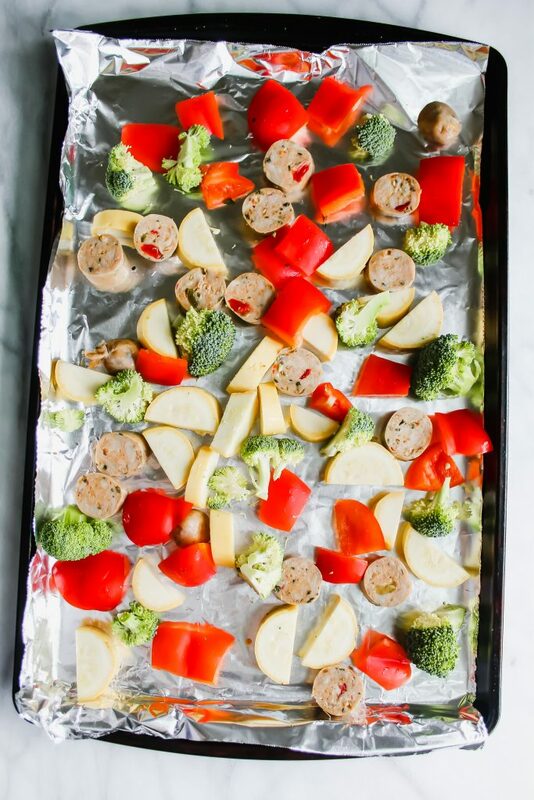 So, this Healthy Sheet Pan Sausage and Veggies recipe is right up my alley. I love how crunchy and roasted the veggies get. I love how deliciously caramelized the sausage gets. And I mostly love putting them on a bed of the most buttery, herb-tastic delicious couscous EVER. Seriously, how have I been missing out on couscous for so long?! It’s extra fluffy, easier to cook than rice and quinoa and has the perfect balance of being fluffy but grainy. And when you add in butter and some herbs, you’re SET for the most delicious easy and healthy sheet pan dinner! Now, this could be the shortest recipe ever of my “how-to make” section of my blog post. All you’ll need is a cutting board, knife, sheet pan, aluminum foil (optional) and the ingredients listed above. First, preheat your oven to 400. Cut the sausage into large, thick rounds, about 1 inch thick. Do the same with your bell pepper. Cut your squash into circles and then the circles in half. Cut your broccoli into small florets. Drizzle some olive oil and spices on them and coat them evenly with your hands by mixing it all together! Place the sheet pan in the oven. Wait to start your couscous for a few minutes. Let the sausage and veggies go for about 15 minutes in the oven then flip them! Bake for an additional 10-15 minutes or until maximum caramelization. Once flipped, start your couscous! Bring water + butter + salt to a boil. Take it off the heat and add in your couscous. Cover and let it sit for about 5 minutes or until extra fluffy. Set aside and keep warm. By now, your veggies and sausage should be extra deliciously roasted. Take them out of the oven. Fill a bowl with the couscous. Top with the sausage and veggies. Remember to chew because it’s so delicious. Dinner = done. Don’t have Italian chicken sausage? That’s okay – use what you have on hand. I would suggest a spicier fully cooked sausage that you can buy in the deli section of the store. I’ve been loving Coleman’s Natural Brand! In fact, I used their Italian chicken sausage for this recipe! It’s spicy and delicious! Don’t have yellow squash? Use zucchini! Don’t have red bell peppers? Green/yellow bell peppers work too! No broccoli? Use cauliflower! Honestly, any sausage and veggie combination should work well. The only problem you may run into is how long they should be in the oven! For example, mushrooms cook extremely fast, whereas potatoes cook a lot slower. A good note is to always try and cut vegetables that you know are going to cook slow (i.e. potatoes) into smaller pieces so they can catch up to the other veggies and cook faster! If you want to meal prep this Healthy Sheet Pan Sausage and Veggies recipe, simply cook everything on a sheet pan on Sunday night. If you want this recipe for several days, you may need to double the sausage/veggie amount since this only serves two people. Distribute your couscous evenly in tupperware containers and do the same with your vegetables and sausage. Since the sausage is fully cooked, it should keep in your lunches all week! Win win. 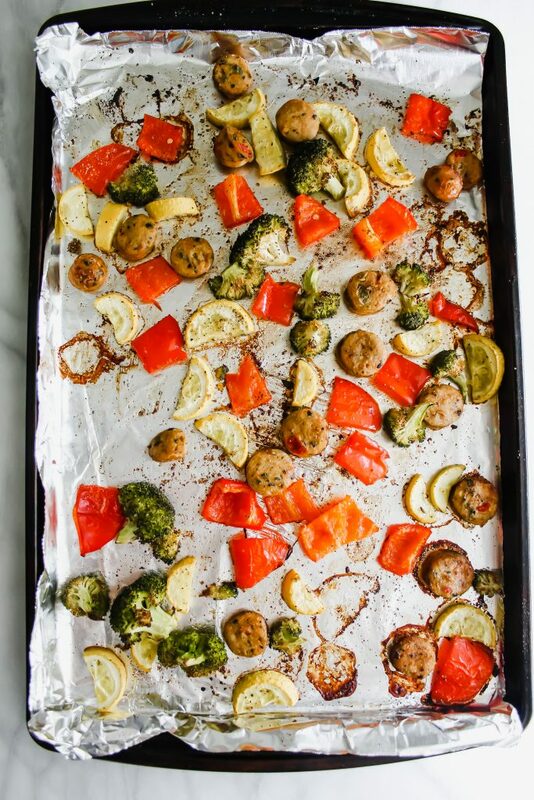 Hope you enjoy this easy weeknight Healthy Sheet Pan Sausage and Veggies recipe. It’s perfect for those who just want to throw their dinner on to a sheet pan and go rest while dinner is cooking! And for all those in the eye of Hurricane Florence, stay safe! Xo. Preheat oven to 400 degrees. Line a sheet pan with aluminum foil. Set aside. Chop your sausage and your veggies. Spread them evenly on the pan. Drizzle with olive oil and spices and mix together to combine with your hands. Bake for 15 minutes, flipping halfway. Bake for an additional 10-15 minutes or until caramelized. While the sheet pan dinner is baking, cook your couscous. Bring 1 cup of water to a boil with 2 tbsp butter and a pinch of salt. Remove from heat. Add in 1 cup of dry couscous. Stir to combine. Cover and let sit for 5 minutes or until fluffy. 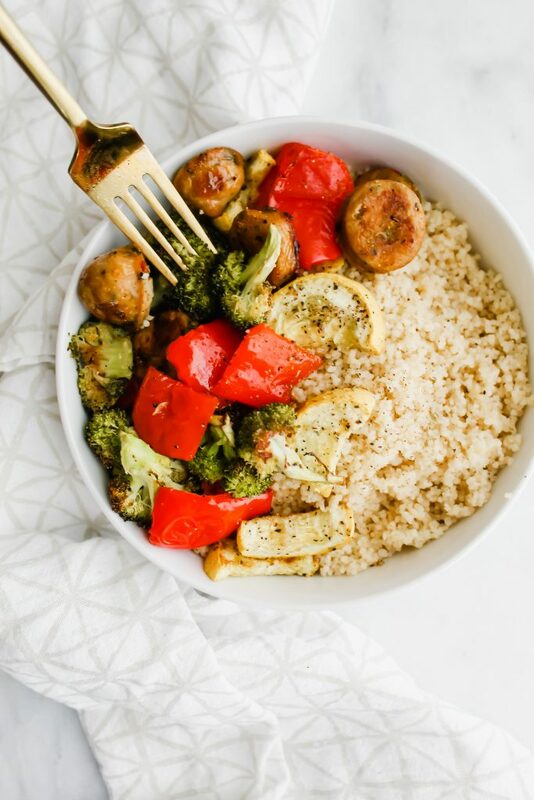 Fill your bowl with couscous and top with the sheet pan sausage and veggies. Serve while hot! Add additional salt and pepper if needed. Enjoy! The nutritional content does take the couscous into account, which is a carb-heavy grain. Otherwise, the sausage and veggies are low-carb!